There are multiple artists/bands with the name Iration: (1) Iration is a rock/reggae band originally from Hawaii but have since relocated to Santa Barbara, CA, US. In 2007, they recorded and released their first full length album "No Time for Rest" at Castaway 7 Studios in Ventura, Ca, which featured one of the last recorded performances by reggae legend Mikey Dread. Their single ?Cookie Jar? reached number one in Hawaii on 93.9 DaBeat and was featured on Fuel TV's Triple Crown of Surfing recap. Their music was also featured on MTV shows Maui Fever and Living Lahaina. 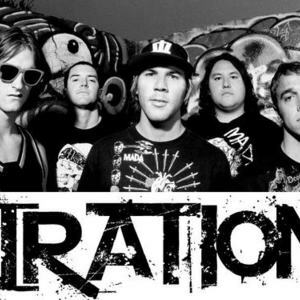 (1) Iration is a rock/reggae band originally from Hawaii but have since relocated to Santa Barbara, CA, US. In 2007, they recorded and released their first full length album "No Time for Rest" at Castaway 7 Studios in Ventura, Ca, which featured one of the last recorded performances by reggae legend Mikey Dread. Their single ?Cookie Jar? reached number one in Hawaii on 93.9 DaBeat and was featured on Fuel TV's Triple Crown of Surfing recap. Their music was also featured on MTV shows Maui Fever and Living Lahaina. In 2008, they embarked on a US national tour titled ?Playboys in Paradise? in support of the band Pepper. They also recently recorded four new songs, two of which were co-written by Grammy Award Winner Charles Brotman. They continue to tour extensively and look forward to bringing their sound to an even larger audience. (2) Iration is a roots reggae band composed by three brothers which begins in the heart of the Caribbean and marks the spiritual birth of their musical talent. They arrived on the island of Montserrat in the West Indies in October of 1973 as exiles of the Pinochet government and in 1981 they migrated to the United States of America. Iration was born in early 1983 and their first performance was at Ramapo High School's 1986 Talent Show in Franklin Lakes, New Jersey. Iration began playing college circuits in the US such as Bucknell University in Pennsylvania, Upsala College, The Bronx, Fort Lee etc. They frequently played at local pubs wirthin the Tri-State area and a leg of the Reggae Sunsplash in Greensboro, North Carolina on Sept. 21st, 1991 opening up for J.C. Lodge, Mojo Nya, Truth and Rights and Art Awareness Ensemble. In April of 1992 they landed in Kingston, Jamaica to record their first single titled ?The Day After? published by Mission 101 Records. Iration is the first reggae group to have recorded professionally under this name and they performed live at the Midnite Ravers show in NYC & were interviewed at the Hapte Selassie show on WBAI Pacifica Radio FM. The single "The Day After" received extensive airplay throughout the caribbean radio programs in Manhattan, Queens and The Bronx including 1190 AM. "Iration is a completely different story. Three brothers: Mario (keyboards), Patricio (bass), and Gino Zamorano (drums) make up the most experienced band of the force, and perhaps the best as well. They moved with their parents to Montserrat in 1973 as political exiles of the Pinochet government. There they grew up with Reggae and other Caribbean rhythms. They then moved to New York in early 1990. Iration has played on the college circuit in the U.S. and has recorded a single in Jamaica in 1993. Moving to their beloved home country in late '94, they established themselves as the leading rhythm section in the country. Now they are rehearsing material for their debut album to be recorded this summer". Iration became the standard in the sense that they were performing with a full band including a brass section and backing vocals, something not seen asa yet in their country within this genre. At that time being independent was viewed as an ultimate suicide but they took on this challenge, giving many interviews on radio, television (mostly culturally oriented program) exposing the mission of reggae music and even turned down a deal with the transnational conglomerate of Sony Music. Iration was performing what was considered as non commercial music and had no airplay, plus their was the fact of their strong lyrical content, so they worked extensively with community radios and performed at many schools for the youth. Looking at the positive side of their music these conditions ultimately gave them the freedom to speak their minds without any limitations and cemented a strong foundation for the upcoming reggae groups in Chile. Iration began playing in most local clubs in Santiago such as the Rockola, La Ozz, Subte Discotheque, Caribbean and Boomerang just to name a few. This was another challenge that was conquered within a reasonable amount of time by Iration even though reggae music was not even popular within this geographical area. It was years of hard work that made Iration a unique underground sensation, they eventually met the grand Dennis Stone a.k.a "DreadStone" who opened up Chile's first reggae and apparel store named "Reggae Centro" in which the youths were intimately exposed for the first time to a very broad variety of reggae music. Dennis Stone has been involved in the REGGAE music biz for over 25 years, started back in the early 80's with his Dreadstone Sound System, NYC (selling his exclusive Dreadstone mixtapes out of VP Records as well as on the streets of manhattan). He later formed BigUp Entertainment with partner Russell Javors in 1990 - managed, produced, promoted artists in Jamaica, US, South America, etc. Dennis has contributed to multiple Gold Record and Grammy nominated Reggae projects including the soundtrack for Disney's "Cool Runnings" film, also co-owned DownUnder Studios in S. Florida with producer Henry K, specializing in Reggae, Hiphop and R&B music. DREADSTONE is also the former manager for Tony Rebel (as well as executive producer for Rebel's acclaimed "Vibes Of The Times" album on Chaos/Columbia). His production team delivered Diana King's demo and first U.S. release "Stir It Up" for Columbia/Sony and assisted in structuring the Stir It Up Tour and the Grammy nominated "Stir It Up" compilation, also for Columbia/Sony. He has been associated with many fine artists such as Prezident Brown, Calton Coffie, Tony Curtis, Jigsy King, Professor Frisky, Nadine Sutherland, Garnet Silk, Uton Green, Ninja Man, Diana King, Bradley Brown, Rythmation, Iration, Gondwana, Roland Alphonso, Fiona, Delly Ranks, Deuteronomy, Natty Remo, Bigga Staar, Magano and many others. DREADSTONE has worked alongside Sly Dunbar, Bobby Digital, Steven Stanley, Henry K, Donovan Germaine, Barry O'Hare, the Kelly Bros., Philip Smart, Courtney Cole, Clive Chin, Kirk Hedge and many other great Reggae Producers as well as Irie FM's popular Mighty Mike Jones. He established "Reggae Centro" in Santiago, Chile in 1998 and promoted Reggae Thursdays at Boomerang in downtown Santiago, featuring Chile's premier reggae band "Iration". Currently based in S. FL, producing and promoting talented reggae artists such as singer/songwriter/drummer Bradley Brown, as well as ongoing projects with established artists such as Carlton Coffie (the original JA Bad Boy), and upcoming singjay artist Adam "Teacha" Barnes. Recording and mixing at Vybetribe Studio in S.FL as well as out of Barry O'Hare's World-A-Muzic Studio located in the historic Jack Ruby yard, Ocho Rios, JA with boomshot engineer/producer Kirk Hedge. He is also currently collaborating with riddim-kings Heddrokk Productions in Miami. Sourcing nuff dubplates from the JA young~maestro "YelloKid" himself (BIGUP YELLO!) and assisting House/Electro producer/DJ extraordinaire Austin Leeds with ongoing projects. Continuing to forward great Reggae Music with a focus on Culture/Conscious Vibes. Iration in 1997 soon followed to pursue the recording of their material and moved to New York City for 3 years. On their return to Chile they became the opening act for groups like Los Pericos, The Wailers, Lauryn Hill, Fabulosos Cadillacs, Aut?nticos Decadentes and Matisyahu. They were chosen as backing band for the performances of Kymani Marley and Andrew Tosh on their first visit to Chile. In September of 2003 Iration was invited by Isabel Allende to participate in the Tribute to Salvador Allende ?El Sue?o Existe? sharing the scene with artistes such as Silvio Rodriguez, Shalil Shankar, Vicente Feli?, Gerardo Alfonso, Los Prisioneros, Daniela Mercury, Julieta Venegas, Salvador Ojeda, Le?n Gieco, Gilberto Gil, Daniel Viglietti, Congreso, Quilapay?n, C?sar Isella & Pedro Aznar. This was one of their best performances up to date and attendance at this tribute was around 80,000 +. Their message is clear and being an underground sensation definitely helped them stay in the cultural eyes of their people. By late 2003 Warner Music Chile releases the album ?Fusion de Estilos 2? by the Hip-Hop group ?Zaturno & Tapia Rabia? in which Iration composes and performs the first single ?Cuando te veo pasar? of the album, the video clip aired on MTV Latino in late September and incorporated the talents of Quique Galdames of the group Illapu. Iration by now had established themselves with enough exposure and basic financing to begin preparations to remix & upgrade addecuately their first album now titled ?En Exilio / In Exile? and begin the task of making their first video clip for the song ?Chile?, a classic example of their talent and quality of composition. Iration's album ?En Exilio / In Exile? has musicians from the U.S.A., Cuba and Chile such as Rich Tozzoli, David Brian Ondrick (USA), Lino Borbolla, Jose Ismael Gomez (Cuba), Francisco Martinez, Ruben Salgado, Loretto Canales, Karen Vergara, Damian Bodenhofer, Fabian Cordova and Efrain Rodriguez (Chile) creating a nice blend of different styles within their music. It clearly has a Caribbean flavor with a slight South American touch and their music represents their conviction to spiritually fight for a better tomorrow, leaving clear that the most important value is to be part of the solution by just simply giving "love". Iration means creation in the patois dialect which is spoken in most of the Caribbean islands where english is the primary language.